One of the key roles and responsibilities of a Guitar Teacher is to teach music lessons of the guitar to students ranging from beginner level to advanced level. Apart from this, some of the other important job tasks that can be found on a Guitar Teacher Resume are: to prepare and plan syllabus and lessons, acquire teaching materials, prepare pupils for music examinations, and to motivate and encourage the progress of the students. 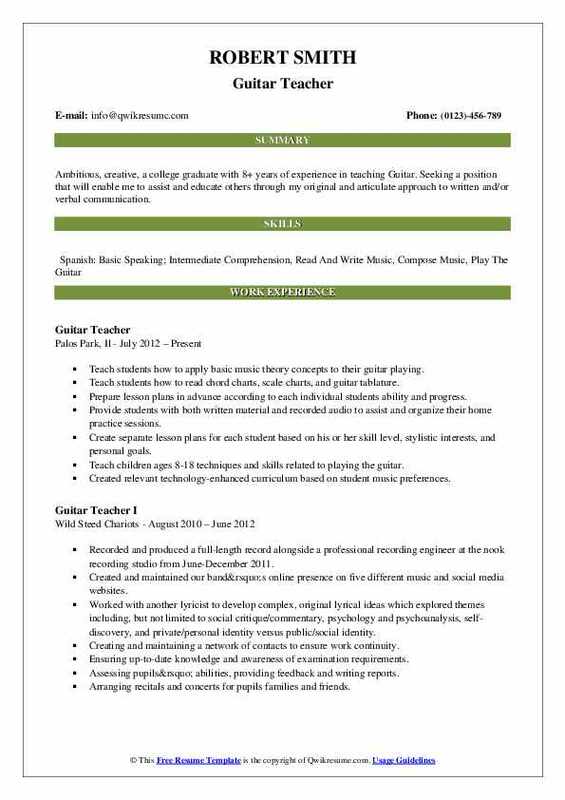 If you are interested in applying for this challenging job role, there are certain qualifications that are expected from you, such as strong knowledge, relevant certification, exceptional teaching skills, ability to compose own tunes, and also a flair for playing almost all the common musical notes. While the minimum education required for this role is a Bachelor’s Degree in instrumental music, a Master’s Degree and relevant work experience are considered to be a great bonus. 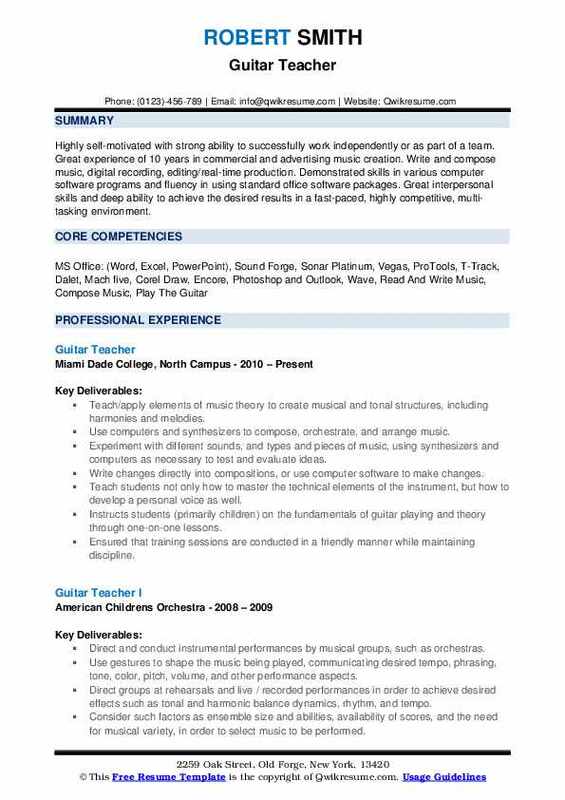 Objective : A motivated student pursuing a BA in Music Education seeking a Guitar Teaching position with 2+ years of experience. Possess a year of teaching private instruction of Rock and Metal styles. Proven Track record in fast-paced environments with a passion for composition and desire to forge a career as an educator, songwriter & composer. Music transcription - transcriptions of rock/metal music (Metallica, iron). Music arranging - arranged, "erlkönig" by Franz Schubert for two electric Guitars, drums with voice. Also arranged "hallow be thy name" by iron. Music recording - solo guitar and band recordings for "teravolt official Band", advanced recording, mixing tracks, skills with pro tools and logic pro x. Music composition - composed an original song for the Tom Hess Inc.
Music Careers mentoring program collaboration album titled "Genesis" (2013). Composed music for classical guitar quartet and performed music for the cal poly Pomona guitar ensemble directed by Dr. Peter Yates (2018). Tailor lesson plans to the strengths and weaknesses of individual students. Work with children and adults of all ages to teach them the foundations of music and the guitar. Teaching electric and acoustic guitar lessons to students of all ages and abilities. Specializing in a creative curriculum to motivate and make learning fun, comprehensive and enjoyable for all. Summary : Highly self-motivated with strong ability to successfully work independently or as part of a team. Great experience of 10 years in commercial and advertising music creation. Write and compose music, digital recording, editing/real-time production. 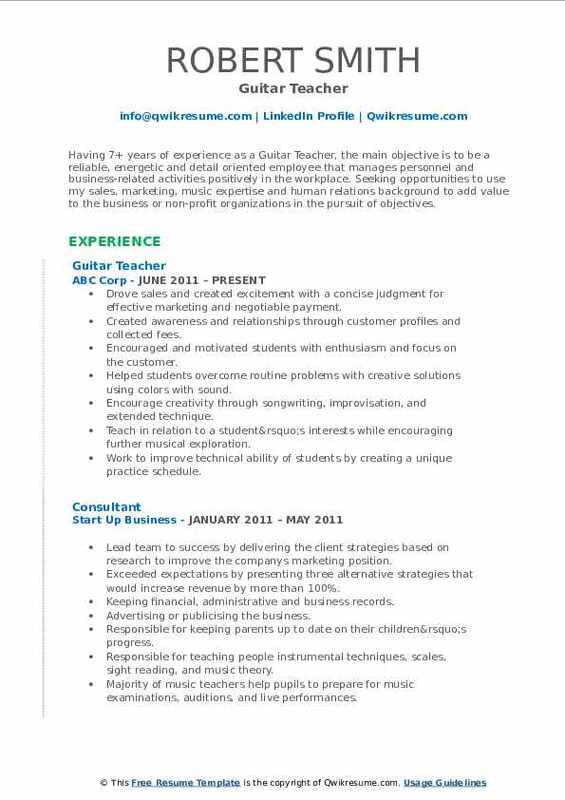 Demonstrated skills in various computer software programs and fluency in using standard office software packages. Great interpersonal skills and deep ability to achieve the desired results in a fast-paced, highly competitive, multi-tasking environment. Teach/apply elements of music theory to create musical and tonal structures, including harmonies and melodies. Teach students not only how to master the technical elements of the instrument, but how to develop a personal voice as well. Instructs students (primarily children) on the fundamentals of guitar playing and theory through one-on-one lessons. Ensured that training sessions are conducted in a friendly manner while maintaining discipline. Advise students (or their guardians) on equipment/instrument purchasing decisions. Give verbal reports detailing the student's progression and outlined areas for improvement. 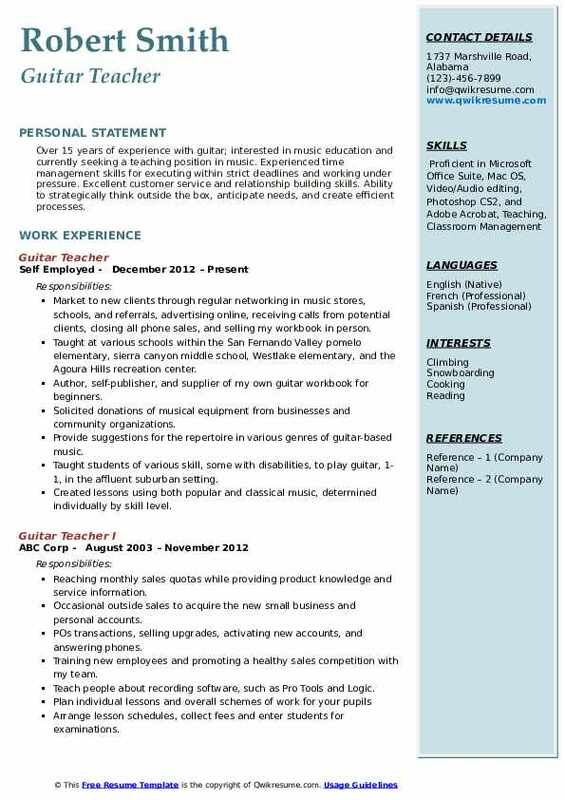 Summary : Ambitious, creative, a college graduate with 8+ years of experience in teaching Guitar. Seeking a position that will enable me to assist and educate others through my original and articulate approach to written and/or verbal communication. Teach students how to apply basic music theory concepts to their guitar playing. Teach students how to read chord charts, scale charts, and guitar tablature. Prepare lesson plans in advance according to each individual students ability and progress. Provide students with both written material and recorded audio to assist and organize their home practice sessions. Create separate lesson plans for each student based on his or her skill level, stylistic interests, and personal goals. Teach children ages 8-18 techniques and skills related to playing the guitar. Created relevant technology-enhanced curriculum based on student music preferences. Prepared students for participation in recitals, competitions, and examinations. Taught students with multiple modalities using appropriate methods and the school curriculum. 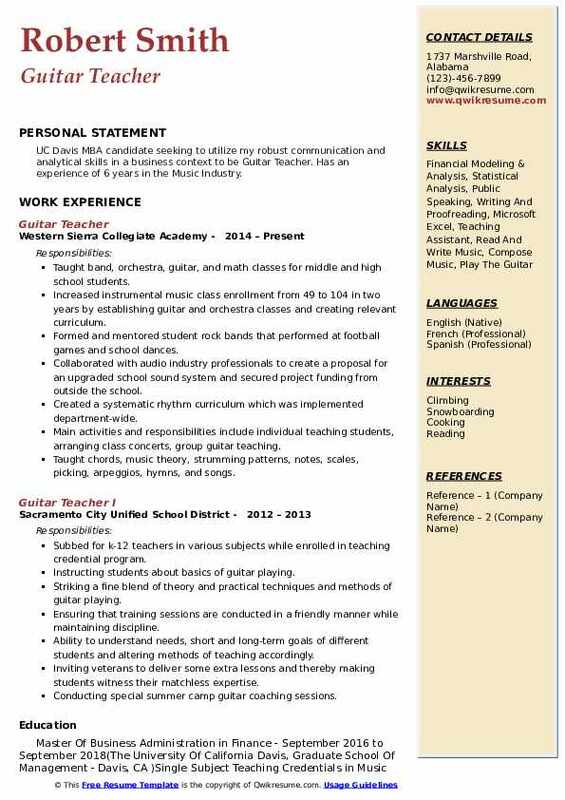 Summary : Having 7+ years of experience as a Guitar Teacher, the main objective is to be a reliable, energetic and detail oriented employee that manages personnel and business-related activities positively in the workplace. Seeking opportunities to use my sales, marketing, music expertise and human relations background to add value to the business or non-profit organizations in the pursuit of objectives. Drove sales and created excitement with a concise judgment for effective marketing and negotiable payment. Created awareness and relationships through customer profiles and collected fees. Encouraged and motivated students with enthusiasm and focus on the customer. Helped students overcome routine problems with creative solutions using colors with sound. Encourage creativity through songwriting, improvisation, and extended technique. Teach in relation to a student’s interests while encouraging further musical exploration. Work to improve technical ability of students by creating a unique practice schedule. Teaching basic guitar, technique and note reading fundamentals to elementary school students. Fostered a respectful learning environment and developed positive partnerships with parents and students to ensure student success. 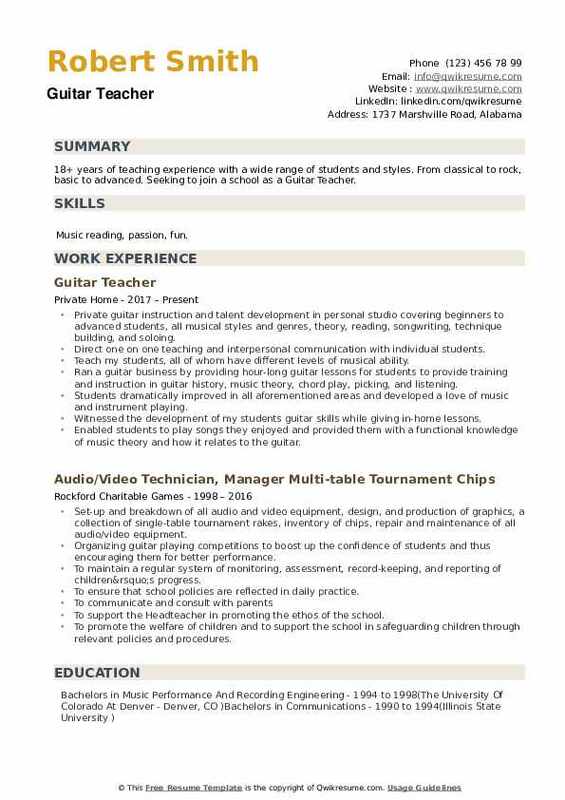 Summary : Over 15 years of experience with guitar; interested in music education and currently seeking a teaching position in music. Experienced time management skills for executing within strict deadlines and working under pressure. Excellent customer service and relationship building skills. Ability to strategically think outside the box, anticipate needs, and create efficient processes. Market to new clients through regular networking in music stores, schools, and referrals, advertising online, receiving calls from potential clients, closing all phone sales, and selling my workbook in person. Taught at various schools within the San Fernando Valley: pomelo elementary, sierra canyon middle school, Westlake elementary, and the Agoura Hills recreation center. Author, self-publisher, and supplier of my own guitar workbook for beginners. Solicited donations of musical equipment from businesses and community organizations. Provide suggestions for the repertoire in various genres of guitar-based music. Taught students of various skill, some with disabilities, to play guitar, 1-1, in the affluent suburban setting. Created lessons using both popular and classical music, determined individually by skill level. Working as an independent contractor at music arts centers running mine in home guitar lessons business. Experience in scheduling, customer service, and record keeping. 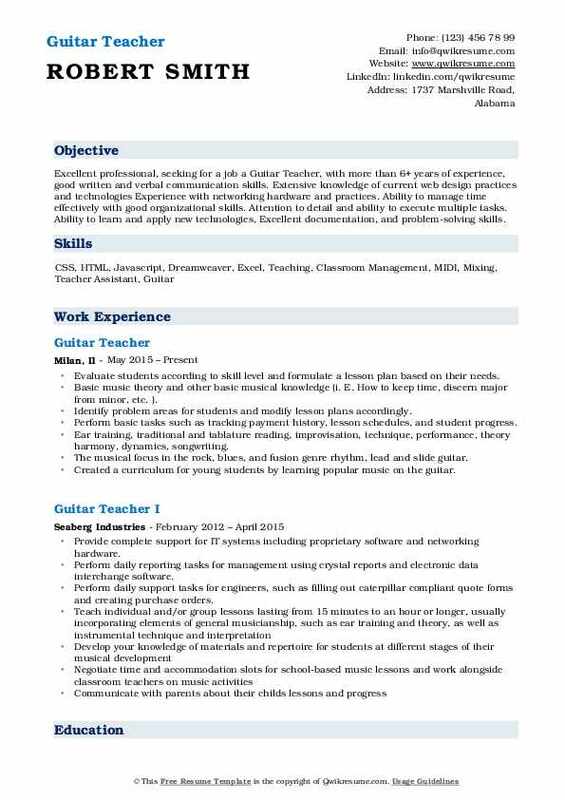 Headline : Excellent professional, seeking for a job a Guitar Teacher, with more than 6+ years of experience, good written and verbal communication skills. Extensive knowledge of current web design practices and technologies Experience with networking hardware and practices. Ability to manage time effectively with good organizational skills. Attention to detail and ability to execute multiple tasks. Ability to learn and apply new technologies, Excellent documentation, and problem-solving skills. Evaluate students according to skill level and formulate a lesson plan based on their needs. Basic music theory and other basic musical knowledge (i. E. How to keep time, discern major from minor, etc. ). Identify problem areas for students and modify lesson plans accordingly. Perform basic tasks such as tracking payment history, lesson schedules, and student progress. Ear training, traditional and tablature reading, improvisation, technique, performance, theory harmony, dynamics, songwriting. The musical focus in the rock, blues, and fusion genre rhythm, lead and slide guitar. Created a curriculum for young students by learning popular music on the guitar. Planned individual and group lessons while understanding each child's stage of musical development. Maintained relations with parents and school administrators to ensure they were informed of each. 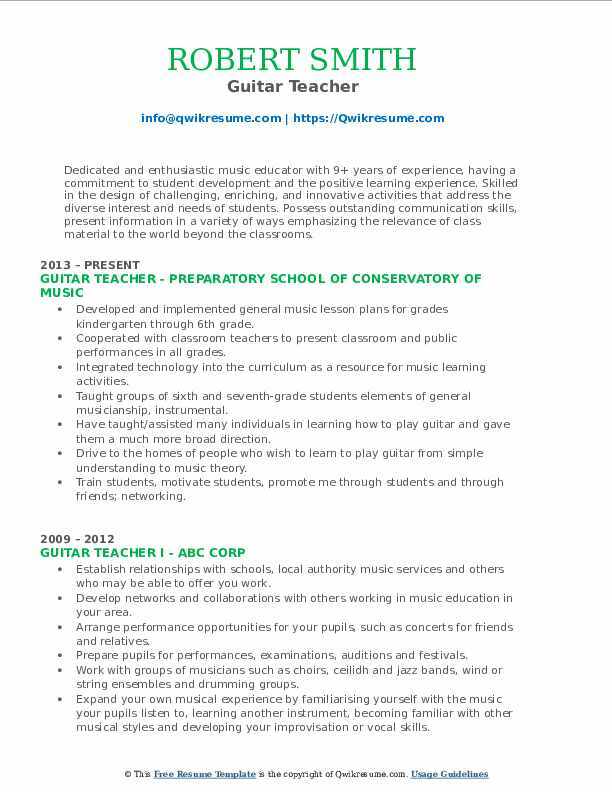 Summary : Dedicated and enthusiastic music educator with 9+ years of experience, having a commitment to student development and the positive learning experience. Skilled in the design of challenging, enriching, and innovative activities that address the diverse interest and needs of students. Possess outstanding communication skills, present information in a variety of ways emphasizing the relevance of class material to the world beyond the classrooms. Developed and implemented general music lesson plans for grades kindergarten through 6th grade. Cooperated with classroom teachers to present classroom and public performances in all grades. Integrated technology into the curriculum as a resource for music learning activities. Taught groups of sixth and seventh-grade students elements of general musicianship, instrumental. Have taught/assisted many individuals in learning how to play guitar and gave them a much more broad direction. Drive to the homes of people who wish to learn to play guitar from simple understanding to music theory. Train students, motivate students, promote me through students and through friends; networking. Teach them guitar through a strict program, which advances them quickly to becoming a successful player. Substituting, tutoring and mentoring students at a variety of different schools throughout the surroundings. 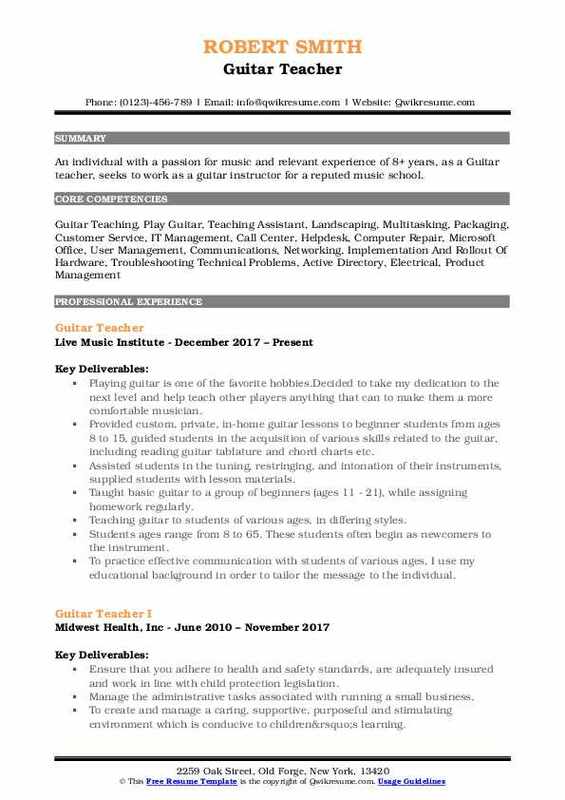 Summary : An individual with a passion for music and relevant experience of 8+ years, as a Guitar teacher, seeks to work as a guitar instructor for a reputed music school. Playing guitar is one of the favorite hobbies. Decided to take my dedication to the next level and help teach other players anything that can to make them a more comfortable musician. Provided custom, private, in-home guitar lessons to beginner students from ages 8 to 15, guided students in the acquisition of various skills related to the guitar, including reading guitar tablature and chord charts etc. Assisted students in the tuning, restringing, and intonation of their instruments, supplied students with lesson materials. Taught basic guitar to a group of beginners (ages 11 - 21), while assigning homework regularly. Teaching guitar to students of various ages, in differing styles. Students ages range from 8 to 65. These students often begin as newcomers to the instrument. To practice effective communication with students of various ages, I use my educational background in order to tailor the message to the individual. Incorporated leadership activities to help students visualize and personalize the learning process. Currently, maintaining a private studio of 60 students per week while also teaching group lessons. Both courses focus on all aspects of music—theory, ear training, performance, music appreciation, improvisation etc. Headline : UC Davis MBA candidate seeking to utilize my robust communication and analytical skills in a business context to be Guitar Teacher. Has an experience of 6 years in the Music Industry. Taught band, orchestra, guitar, and math classes for middle and high school students. Increased instrumental music class enrollment from 49 to 104 in two years by establishing guitar and orchestra classes and creating relevant curriculum. Formed and mentored student rock bands that performed at football games and school dances. Collaborated with audio industry professionals to create a proposal for an upgraded school sound system and secured project funding from outside the school. Created a systematic rhythm curriculum which was implemented department-wide. Main activities and responsibilities include individual teaching students, arranging class concerts, group guitar teaching. Taught chords, music theory, strumming patterns, notes, scales, picking, arpeggios, hymns, and songs. Driving to homes, upbeat, friendly personality, responsible on time. Playing guitar--understanding chord formation, understanding strums for various songs, teaching reading chords, reading notes. Summary : 18+ years of teaching experience with a wide range of students and styles. From classical to rock, basic to advanced. 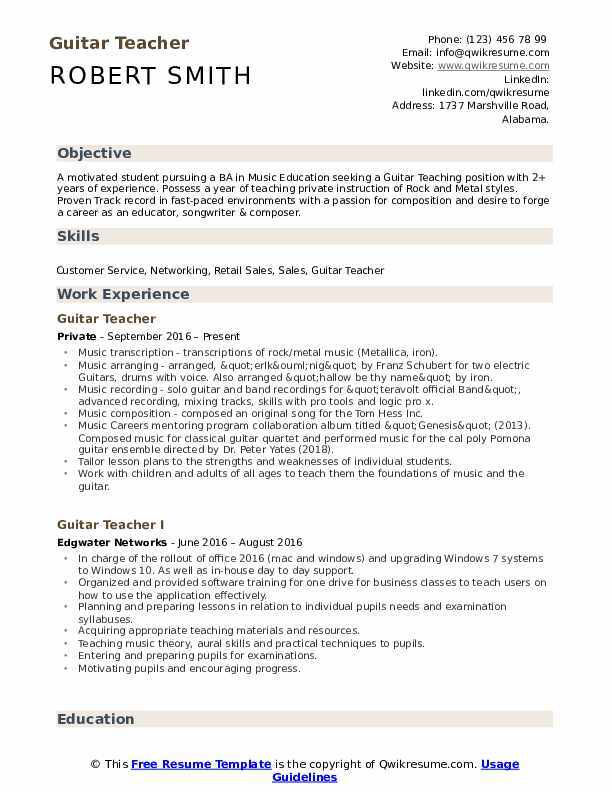 Seeking to join a school as a Guitar Teacher. Skills : Music reading, passion, fun. Private guitar instruction and talent development in personal studio covering beginners to advanced students, all musical styles and genres, theory, reading, songwriting, technique building, and soloing. Direct one on one teaching and interpersonal communication with individual students. Teach my students, all of whom have different levels of musical ability. Ran a guitar business by providing hour-long guitar lessons for students to provide training and instruction in guitar history, music theory, chord play, picking, and listening. Students dramatically improved in all aforementioned areas and developed a love of music and instrument playing. Witnessed the development of my students' guitar skills while giving in-home lessons. Enabled students to play songs they enjoyed and provided them with a functional knowledge of music theory and how it relates to the guitar. Provide a good foundation for children and adults to learn guitar--a learning environment where they can have the freedom to learn at their own pace and according to their own abilities. Build connections in musical empowerments network of teachers to give and receive help with approaching lessons.